So here it is April 3rd and I am sitting here reflecting on how long I have been in business. I’ve counted on my fingers 3 times so far and came up with 34 years. I can’t believe it’s been this long because I really believe we are just getting started. But what baffles me is the fact that I am writing this newsletter to you sitting in front of my wood stove. I’ve been muttering to myself, really? The wind is howling and it is snowing a bit. Really? And the forsythia, cherry trees, andromeda, and daffodils are almost in full bloom. And my best friend was in Nantucket celebrating 38 years of marriage driving back to Northampton in a complete whiteout. Really? A lot of reallys. But we are really excited for season. We have been cleaning and prepping your properties. This week we will be spraying dormant oils, tick spraying (yes they are out already), and will begin our first round of lawn fertilizations. And within 10 days we will start cutting your lawns. Our tree climbers have been busy trimming and cutting down unnecessary trees, our installation crews have been busy with our site work, our masonry crews have been building steps, walkways, and walls, and Cindy and I have been working on some great concepts and designs. We have finally become the company we always envisioned, and you are the reason for this. We are humbled and grateful that some of you have stuck with us over the last 25 years. I have no regrets for the career path I have chosen. It gives me a chance to be at my creative best and I have met and worked for some of the most interesting properties and people in the world. The relationships we have cultivated are priceless. Thank you all in advance. Please read on. When I attended my first trade show in 1985 I was in awe and a bit overwhelmed by the amount of vendors selling their stock. I took home at least 30 catalogues. Even living on Long Island in 1985 was more expensive than most places in the country. I brought them home and studied them for over a week. I was shocked to see that the Long Island prices were almost twice as low as other states. I was completely baffled and did quite an extensive comparison and research. What I came away with was amazing. The history of wholesale trees and shrubs is remarkable. Many Jewish and Italian immigrants found their niche in the planting industry on Long Island. Within a short amount of time the competition was fierce. That’s what kept the prices lower than any other part of the country. No other tradespeople other than landscapers could buy from them. As competitive as they were they had a mutual understanding with each other. These agreements were honored until the early nineties. A recession had hit. The old guard was dying out. The new generation of wholesalers were panicking. The wholesalers started selling to builders, various tradespeople, and even some homeowners. I was horrified to see prices doubling and was worried how I could survive with all the competition. This is America, land of free enterprise, but I had to find a way to change my marketing strategies. I hopped in my car for almost two weeks and found many growers of trees and shrubs in the eastern states. Jackpot!! I started buying plant materials from nurseries that wholesalers were buying from. To make a long story shot, I have passed that savings onto my clients while maintaining my profits. A big win win for everybody. My biggest seller are boxwoods, large and medium evergreen and deciduous trees. It really added a new dimension to our sales. Looking back I really think it pulled us through a couple of bad recessions. Many tradespeople have never recovered. So before you or your friends make that purchase, call us for quotes. We will even provide you with references of many people who have bought from us. Nobody beats our quality or prices. There are only two old time wholesalers left that I know of and still maintain great relationships with them. Real warriors who are saddened on what has transpired in our industry. As for the other wholesalers, who can criticize what they do? Not me. I respect them but my clients come first. 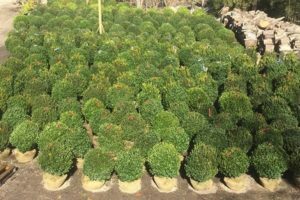 Check out our beautiful freshly dug Boxwood at our shop. Copyright © 2016 C Mac Landscape, Inc., All rights reserved.